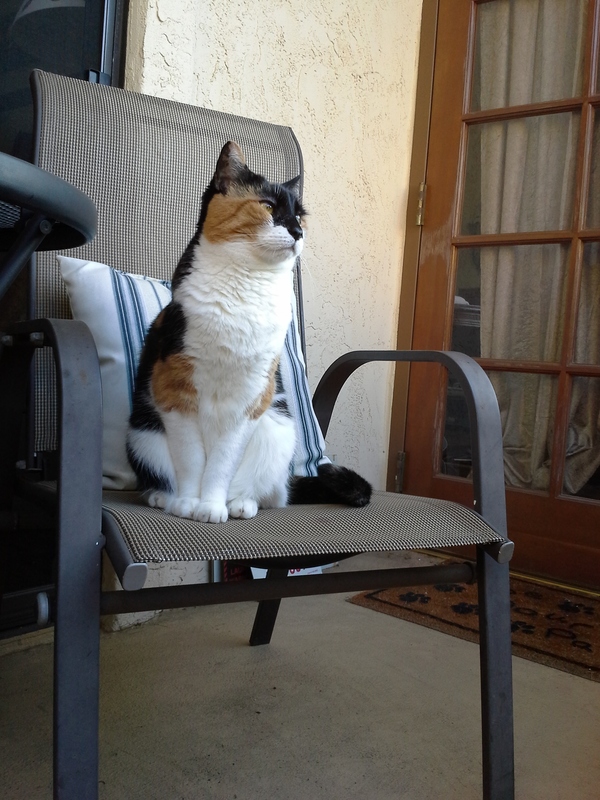 August 24, 2013 July 7, 2014 Joanna V.
She is enjoying BIRD WATCHING (since I don’t allow any of her preferred passtimes of BIRD CATCHING and BIRD MANGLING) in this picture. She’s always been the more adventurous of the two kitties (Caspian is sitting on the other side of the sliding door where he can “safely” watch the outside without having to, y’know, actually go outside) and likes to participate in whatever I’m doing. The only thing that bugs me about her going outside is that she’s got so much white fur… and she also enjoys rolling in whatever dirt she can find. So I wind up with a dirty cat that looks DINGY on top of everything else. But I love how she sits with her feet all together and looks so dainty, even if she isn’t really.